The Eurosport Player app lets you enjoy unlimited access to the Eurosport channels. You can watch exclusive content live and on demand on your Xbox 360 console. At least 125 megabytes (MB) of available storage space. A current Eurosport account, and the password and email address that you use for that account. Select Eurosport Player to download and install the app. After the download, the app automatically starts, and you can browse through the catalogue and view details about the available content. To start the Eurosport Player app later, go to TV & Movies, My Video Apps and then Eurosport Player. When you launch the app for the first time, you’ll be given three options. Select the offer of your choice. Read and agree with the Specific Conditions of Sales. Select your payment method and validate your subscription. Enter your credit card details on the secure payment page and validate your payment. 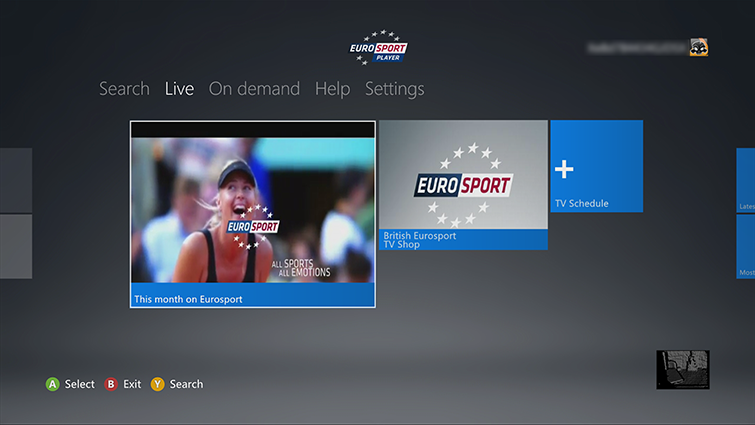 Once your payment has been validated, you'll have immediate access to Eurosport Player on your Xbox 360. If you have a current Eurosport account, select Log In. 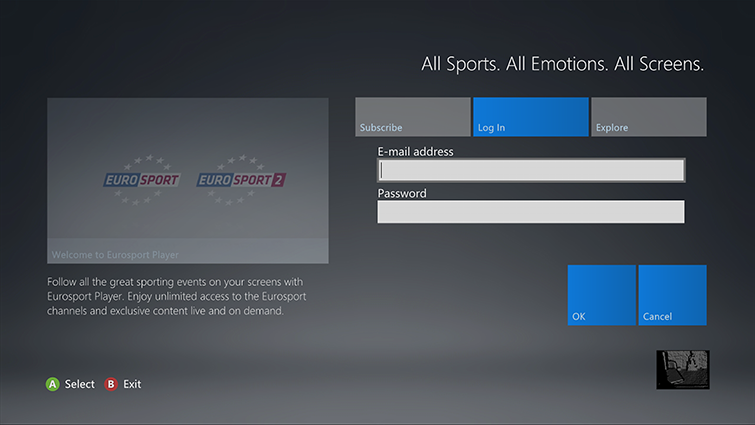 Then enter the email address and password that are associated with your Eurosport account. Select Explore to browse the app for free. You’ll be prompted to sign in or subscribe before you can view any content. Watch the live featured programmes displayed in the centre of the hub. Go to On demand to browse the content that has played on the Live hub in the past seven days, or search by title on the Search hub. To manage your account, visit the “My Account” section on the Eurosport Player website. If you use Family Settings to control which films and TV programmes can be watched through Xbox Live, the Eurosport Player app will follow these settings. For example, if you use parental controls to restrict some kinds of TV programmes, those programmes will be marked with a "restricted video" icon in the Eurosport Player app. To play a restricted item, an adult must enter the Family Settings pass code. Would you like to contact Support regarding the "Set up and use the Eurosport Player app on Xbox 360" issue you were reading about or a different issue?